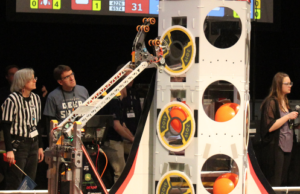 The robotics team has been all across America to participate in competitions in the past. From St. Louis to Minneapolis and Houston to Duluth, the team has been nearly everywhere, and this fall they added a new place to the list. The team jumped across the pond to the west and found themselves in China. 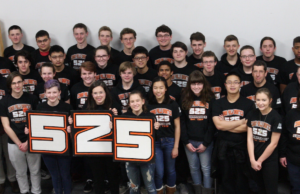 The Swartdogs, or “Team 525” went to China in order to participate in practice events and help team members and volunteers in China along the way. FIRST (For Inspiration and Recognition of Science and Technology) Robotics is growing in China, and last year, eight Chinese teams participated in robotics competitions in the United States. Since it is difficult for teams to bring a robot and all of their team members to America, members are looking to host regionals inside of China, but FIRST requires that there be at least 15 local teams. Since teams that are already established are looking to gain experience, a group called “The China Robotics Challenge” hosted a simulation of a real regional competition. 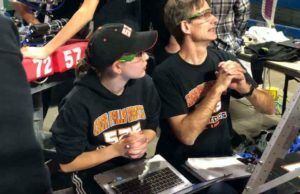 “Our goal with the trip was to organize a scrimmage, train volunteers on the teams, to help build robots, and to participate ourselves,” physics teacher and robotics mentor Kenton Swartley said. Junior Sam Zhang, one of eight students to make the trip, said he thinks that the team accomplished its goals. FRC is a subsection of FIRST aimed toward high school students. FIRST has created FIRST Lego League for younger students, and FIRST Tech Challenge for high school students as well. Some Swartdog mentors made a trip to China last December to provide training for new robotics mentors in China. That trip was part of an ongoing partnership with a Chinese businessman, Mr. Yue, who is leading the growth of FRC teams in China. Since Swartley went to China last December, his most memorable moment was not experiencing a new culture, but happened during the competition. In addition to helping out local teams, the Swartdogs had a good time in China as well. The team stayed in China for six days at a hotel in Shenzhen.